It stressed « the principles of defense, self-defense and post-emptive strike. » It said China isn’t aggressive. It will « counterattack » if attacked. China’s navy will defend offshore and « open seas » waters. Cybersecurity will be prioritized. Beijing opposes weaponizing space. It « vowed to secure its space assets. » It pledged no nuclear arms race with other countries. It fundamentally opposes hegemonism and power politics in all forms. It faces multiple complex security threats – including « illegal, military presence on China’s territory, and outside parties involving themselves in South China Sea affairs, » a clear reference to US regional meddling. 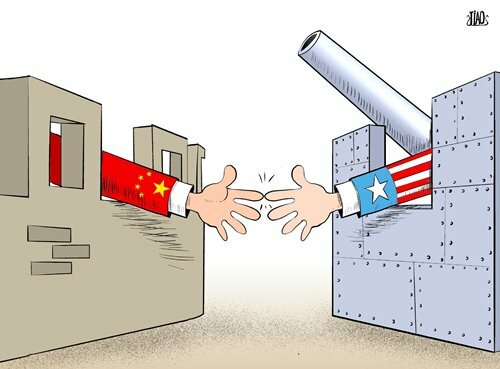 « China will have no choice but to engage » in response to US provocations. Beijing’s waters are its own. Its message says it won’t tolerate US intervention where it doesn’t belong. China is concerned about America’s increasing Asia/Pacific presence as well as Japan’s intent on « overhauling its military and security policies » cooperatively with Washington. « (A)nti-China forces have never given up their attempt to instigate a color revolution » against Beijing, the white paper said. The risk of potential conflict is real. US Pacific fleet commander Admiral Harry Harris accused Beijing of building a « great wall of sand » in disputed waters. The area involved is 1.5 square miles. « How China proceeds will be a key indicator of whether the region is heading towards confrontation or cooperation. » Harris said. China justifiably claims the right to build in its own territorial waters – « indisputable sovereignty over the Nansha (Spratly) Islands and adjacent waters, » it says.